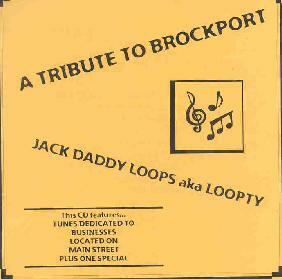 Jack Daddy Loops AKA Loopty - "A Tribute To Brockport"
Those who have read my earlier reviews will know that Jack Daddy Loops AKA Loopty is a solo project from Brockport, New York resident Barry Greenberg. Barry is also a Brockport business owner (A Better Cartridge), and on his latest release he pays tribute to his fellow area business men and women. The CD opens with "Welcome To Brockport" and closes with "Hairport", both of which feature the freaky trip-hoppy style that is common across all Jack Daddy recordings, along with dancey space melodies. They've got a cool off-kilter groove, but are a bit sparse and I wish the heavier keyboards that only come in during the last minute of "Welcome To Brockport" had been introduced earlier in the song. But Barry takes of with the next track, "Trader Shag's", which has a great mixture of symphonic prog keyboards and electro dance elements. Barry is also getting better all the time in the melodic department, having created a simple but majestic instrumental with a powerful vocal quality. "Barber's Grill" and "Shelly's Shades" are similar to "Welcome To Brockport" in that they sound a bit too skeletal... as if they were missing some much needed layers. However, "Barber's Grill" in particular is definitely the germ of a great tune, including more excellent melodies and keyboard sounds and a couple of nifty spacey trip-out bits. "Coleen's Cafe" is similar, and includes some great space moments. Jack Daddy's music always seems to benefit from a fuller sound, and as if in answer to the call, "Java Junction" delivers with a fun blend of spaced out toe tapping, body shaking Salsa, Rave and Trance music. One of my favorites of the set. "The Canal" is another highlight and might well be one of Barry's most intense and spaceiest songs to date. And "Go Ask Alice" is one of the darker tracks of the set, though it's also got a bouncy dance groove which provides a strange but interesting contrast to the intense laser-like keyboard lines. In summary, Jack Daddy Loops continues to grow... musically, creatively and compositionally. I say that despite being somewhat more critical this time around, though I've heard quite a bit of his music at this point, feeling fairly in tune with what he's doing and hearing the growth process with each new release. Lots of good stuff here if you like unexpected elements mixed with your space rock. For more information you can visit Jack Daddy Loops AKA Loopty at the Barry-G web site at: http://www.barry-g.com. Contact via snail mail c/o A Better Cartridge Co.; 46 Main Street; Brockport, NY 14420.